1) "The mode of preparing table mustard patented by M. [Mr. Alexis] Soyer [1810-1858, British], consisted in steeping mustard seed in twice its bulk of weak wood vinegar for eight days, then grinding the whole into paste in a mill, putting it into pots, and thrusting a redhot poker into each of them. 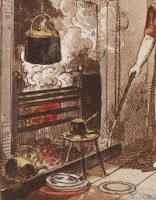 2) M. [Monsieur Louis-Sebastien] Lenormand [1757-1837, French] gives the following prescription for preparing mustard for the table. With 2 pounds of very fine flour of mustard, mix half an ounce of each of the following fresh plants; parsley, chervil, celery, and tarragon, along with a clove of garlic, and twelve salt anchovies, all well minced. a redhot poker is to be thrust down into the contents of each, which removes (it is said) some of the acrimony of the mustard, and evaporates a little water, so as to make room for pouring a little vinegar upon the surface of the paste. Such table mustard not only keeps perfectly well, but improves with age."